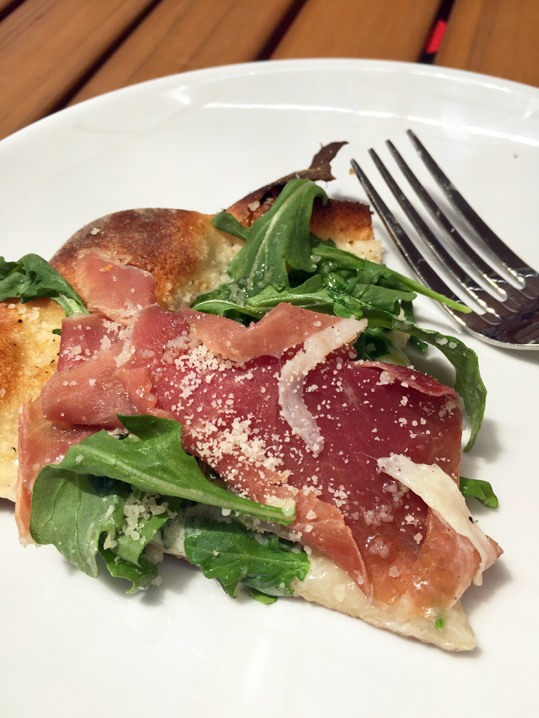 The Redwood City restaurant boom continues with this week’s opening of Howie’s Artisan Pizza. Taking over the old Tarboosh spot on Jefferson Avenue, Howie’s brings chef/restaurateur Howard Bulka’s casual pizza concept to the mid-Peninsula. Bulka, former chef/owner of the (now closed) Marche Restaurant in Menlo Park, opened the first Howie’s Artisan Pizza in November 2009 in the Palo Alto Town & Country shopping center. 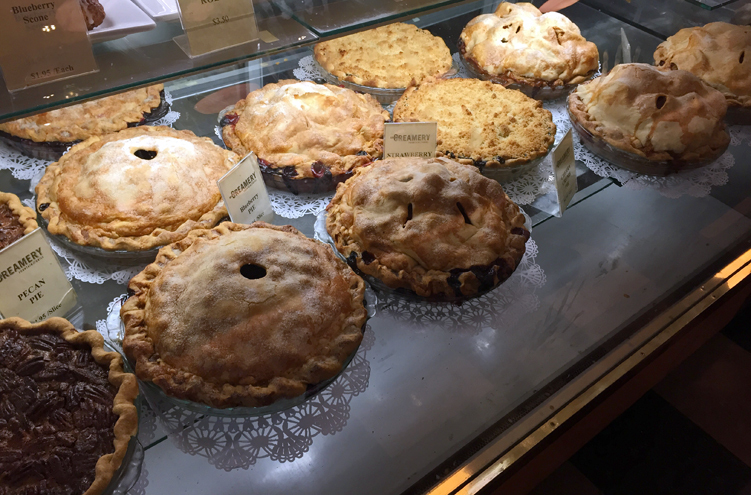 The Palo Alto Howie’s has done well with steady business, particularly on weekends and throughout the summer when it packs out with local families. Think of the Redwood City location as “Howie’s 2.0” — an expansion of the Palo Alto concept, according one staff member. The new space echoes the casual feel of the Palo Alto location, but has more outdoor seating, with the large side patio area that’s set up for year-round dining. About half of the patio area is covered, but tables in the open area have umbrellas to shade diners from the summer sun. For chilly days (or evenings), overhead heaters provide warmth. The interior of the restaurant is large and casual with front doors that open completely, bringing the outdoors in and giving the restaurant an airy feel. Seating is at individual tables or the long bar, which runs the length of the dining room. What is new in the Howie’s concept is a full bar program that not only includes beer and wine, but also handcrafted cocktails. Howie’s Bar Manager, Ryan, is ramping up the cocktail program slowly, presenting an approachable menu of classic cocktails with contemporary twists. For the house Mai-Tai, Howie’s bartenders muddle fresh almonds with Demerara sugar to elicit an aromatic, fresh almond flavor that plays beautifully with the dark rum. Can’t get to the beach? 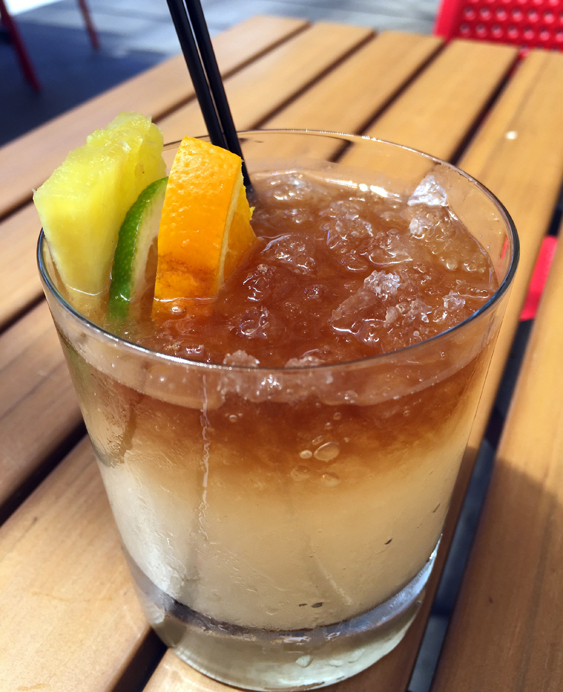 Take a tropical break with Howie’s Mai-Tai. Ryan’s Pisco Punch is a take on the classic Pisco Sour (pisco, lemon juice, sugar, and egg white) that uses house-made pineapple gomme syrup. And then there’s The Heat of Passion, which had me at hello. Don Julio Reposado tequila, passion fruit and lime juices, along with a hint of Calabrian chili. ‘Nuff said. And this is just the start. Plans are in the works to add seasonal cocktails, infusions, and housemade bitters and tinctures. Cocktails not your thing? The beer menu includes about a dozen craft beers on tap, most from around California. Craving a Bud Lite or classic PBR? Yeah, they’ve got that, too. The wine list has something for just about everyone, from crisp whites that will be perfect sipping on warm summer days to fruity, rich reds to pair with red-sauce pizzas. (Although white wine drinkers might prefer to see a few more white wine choices, including a by-the-glass option for the lovely Flowers Chardonnay.) Of course, non-alcoholic options, including soft drinks, are available as well. With drinks squared away, you’ll be ready to move on to the food menu, where comfort food is the theme. While pizza is the main draw, the food menu also offer small plates/appetizers, meal-sized salads, and sandwiches (listed as “Burgers and Such”). Not sure what to get? The servers are knowledgeable and happy to offer suggestions and tell you about items unique to the Redwood City menu, such as the small plates Eggplant Pillows and Burn Your Fingers Shrimp. The Eggplant Pillows are long, thin slices of roasted eggplant rolled around a dollop of fresh, housemade ricotta cheese and topped with salsa verde. Tempting, but I opted for aptly named Burn Your Fingers Shrimp. 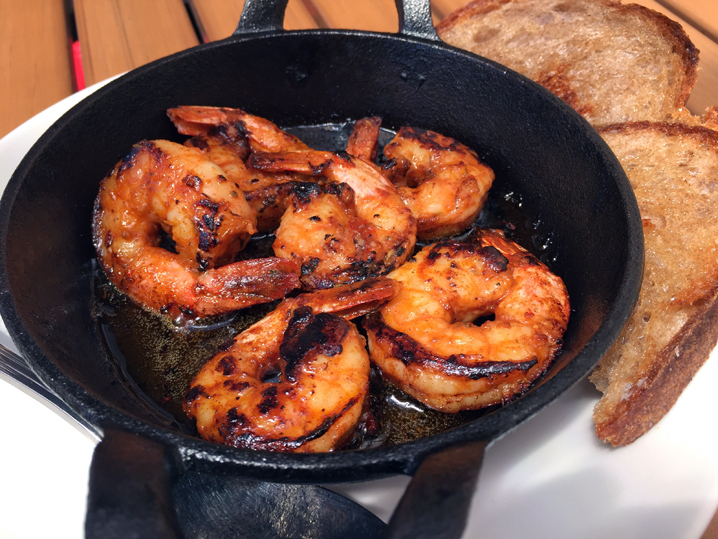 Six large cajun-spiced peel-and-eat shrimp are served sizzling hot with melted, browned butter in small skillet, along with two pieces of toasted bread for mopping up the extra browned butter. Messy, spicy, buttery, delicious. But definitely not first-date food. Moving on from Small Plates, you’re likely to skip right on over to the Pizza section of the menu. (I’m not saying you should, but Howie’s is a pizza joint, after all.) What makes a “good” pizza is a completely subjective thing. For some people, it’s all about the toppings. 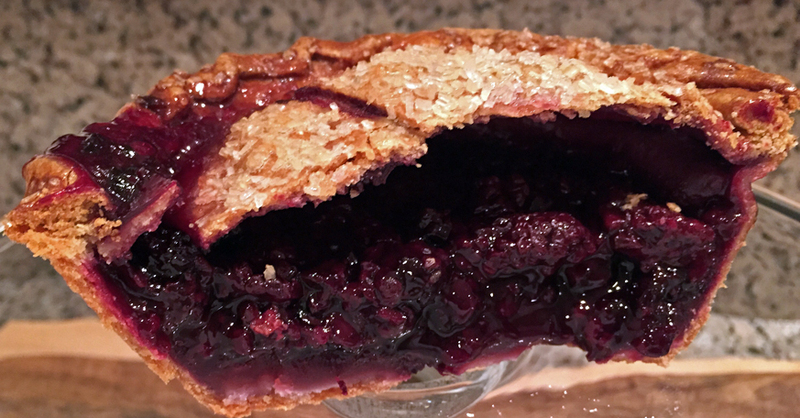 For others, it’s all about the crust. If you’re a crust fanatic, Howie’s falls somewhere between a Neapolitan and New York style pizza. Crispy on the bottom, this is no cracker-like crust; it’s got some depth and chewiness, thanks to a sourdough starter. The crust is sturdy enough to stand up to meat and vegetable toppings, and there’s an even balance between toppings and crust. Toppings are fresh, and you can choose from the nine classic combos, or come up with your own. House favorites include the Margherita (red sauce, mozzarella, fresh basil), Sausage and Peppers, and Arugula and Prosciutto. If you don’t feel up to consuming a full-sized pizza on your own, Howie’s offers a smaller Petitz’a, which is their individual-size pizza, for about half the price of a full size. Any pizza on the menu is available as a Petitz’a. Can’t decide on just one? 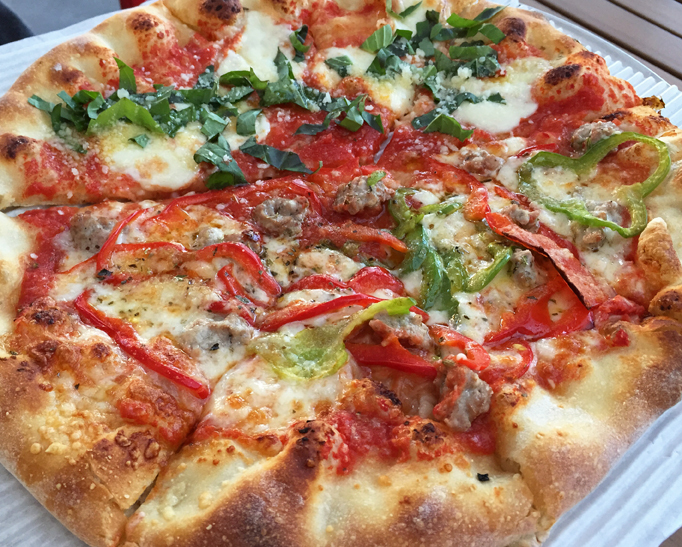 Try this half-n-half: Sausage & Peppers and Margherita. If you’re eating light and opt for a salad, know that Howie’s salad plates are substantial — plenty for a meal or to share if you’re also splitting an appetizer or a pizza. 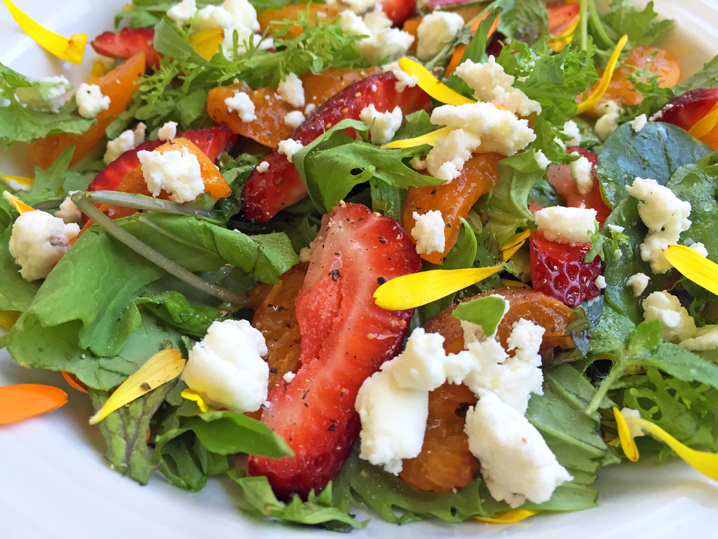 Among the five salad choices are classics, such as Mixed Greens and Caesar. You can add grilled chicken to any salad for an upcharge. If you’re pizza-ed out or just looking for something different, check out the Burgers and Such section of the menu. Options include a variety of sandwiches from the Howie’s Burger (pepper jack cheese, grilled onions, lettuce, pickle, and of course, a secret sauce) to a classic grilled cheese with marina sauce for dipping (perfect for the kids). Non-meat and vegetarian options are available, including a Caponato Melt with eggplant, peppers, onions, zucchini, olives, mozzarella, fresh basil, and parmesan. Phew! 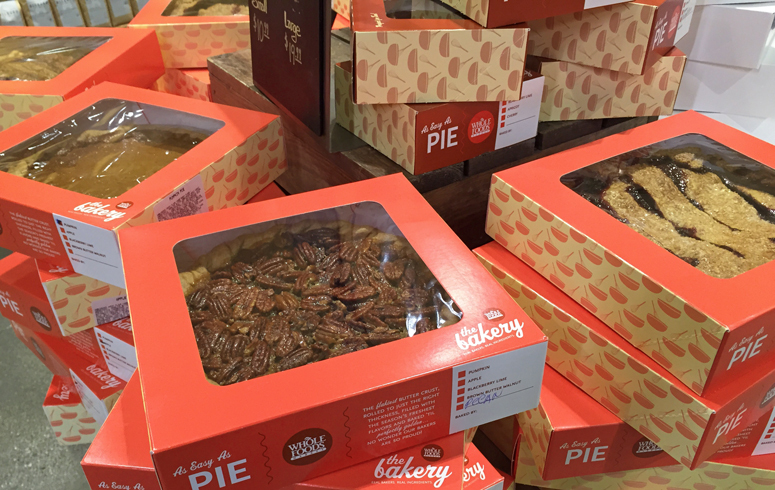 If you’ve still got room for dessert (you go! 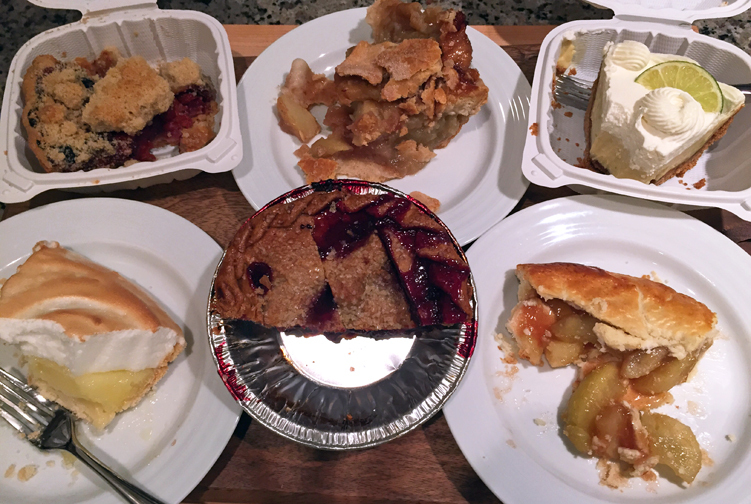 ), Howie’s does offer a few home-style, comfort-food choices: Banana Cream Pie, Seasonal Fruit Crisp for Two, and a Cookie Plate. 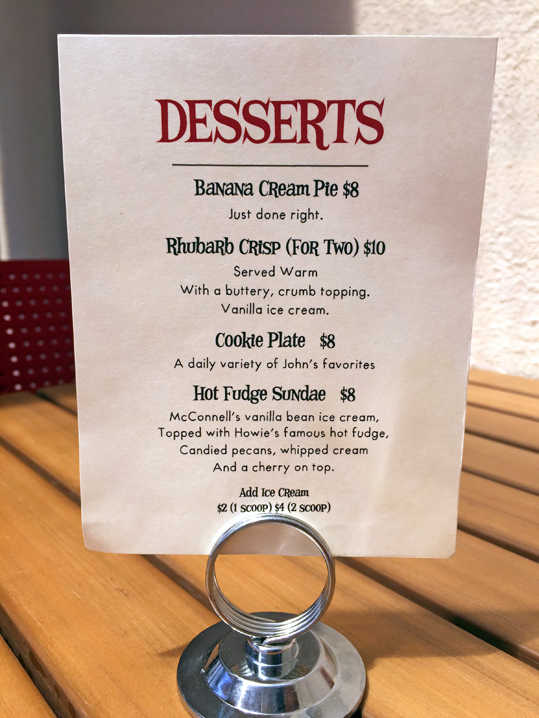 Servers tell me the Banana Cream Pie is a good bet, but I’ll have to report back on that at a later date. Although Howie’s “opened quietly this week,” as Bulka put it, it’s not likely to stay quiet for long. Bulka and staff are chatting with customers, taking suggestions, and tweaking things to, as Bulka put it, “get it right.” They’re definitely on their way. With a casual vibe, comfort-food menu, plenty of seating, and central Redwood City location, this could be your new mid-Peninsula spot. Have you visited the new Howie’s Artisan Pizza in Redwood City yet? Share your experience in the comments below or on our Facebook page. 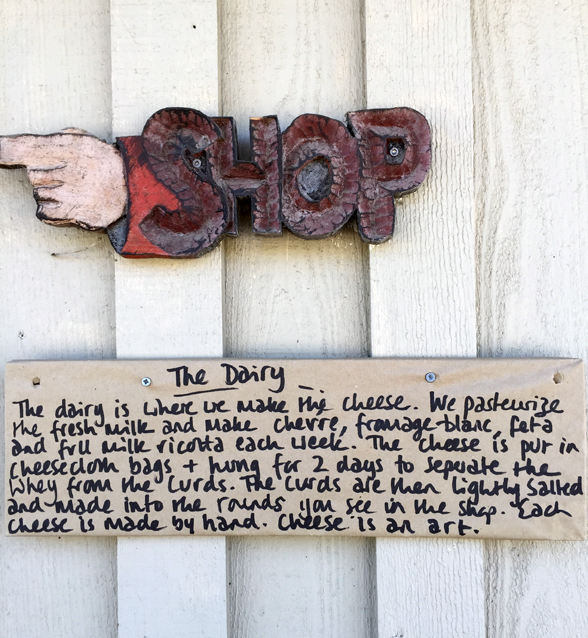 I love a good food story, particularly when it comes to the hows and whys of food producers doing what they do. 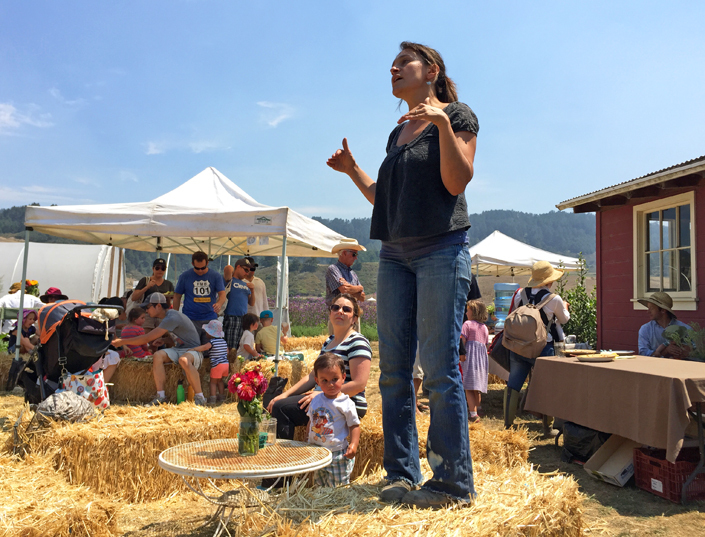 Whether we’re talking about small-business foodcrafters, farmers, chefs, or restauranteurs, the “why” often comes down to two things: a love of food and a desire to share what you make or grow with your community. 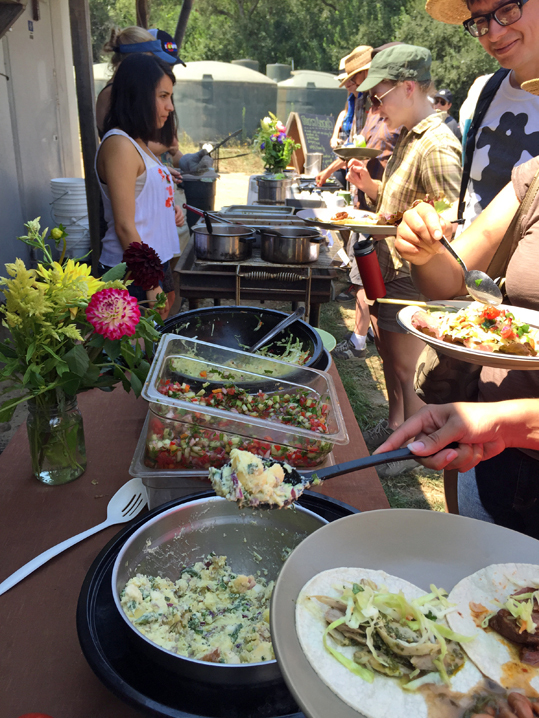 From farmers’ markets to salsa competitions to food-and-wine tastings, the 650 has no lack of community-based food events where food lovers can connect with local producers. Add to that list this year’s inaugural Redwood City Restaurant Week, April 23-29. That’s right, the mid-Peninsula locale formerly known as “Deadwood City” for its long-time lack of entertainment and dining options has experienced a major revitalization, including a now-vibrant dining scene. Redwood City has its own food story to tell: it’s a growing city with a diverse array of ethnic cuisines, not to mention Michelin Bib Gourmand picks and OpenTable Diner’s Choice Award Winners. 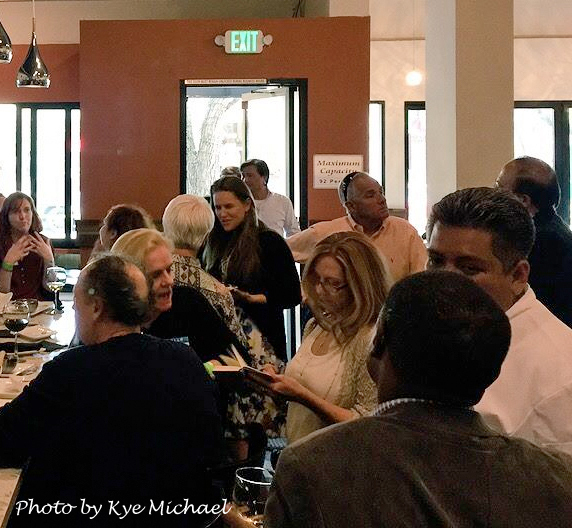 During the recent kickoff party for Redwood City Restaurant Week, I had a chance to chat with local restauranteurs and event participants, Manuel Martinez and Diane Cusimano, about the city’s changing dining scene and what this upcoming event means. Cusimano and her husband Renato, long-time Bay Area restauranteurs who lived in Atherton for 25 years, saw the potential in Redwood City almost a decade ago. 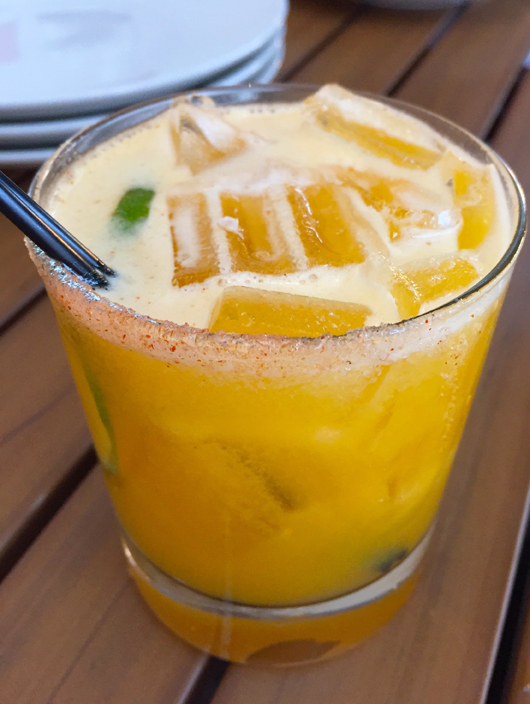 It was Renato who viewed Redwood City as the Peninsula’s “next big thing” and opted for a spot on Main Street for their Deseo Tequila Lounge. Six years since opening the lounge and not quite a year since adding Palermo Italian Restaurant, they’re happy with their decision and have a loyal clientele. Cusimano pointed out that the “diversity in cuisine” is one of downtown Redwood City’s strengths. Indeed, Restaurant Week participants run the gamut of global cuisine from American to Persian. Whether you’re an expat wanting to experience a taste of home or Bay Area local wanting to try something out of your comfort zone, there’s a restaurant for that. 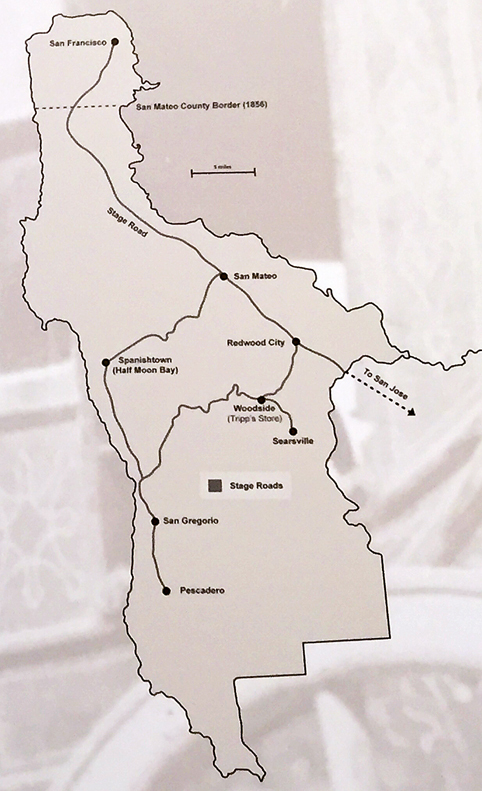 There’s also an opportunity for Redwood City’s restaurants, many of which are family-based businesses, to tell the story of their native cuisines and culinary passions. In the Cusimanos’ case, Deseo allows them to express Renato’s passion for tequila, while Palermo focuses on the cuisine of his native Sicily. 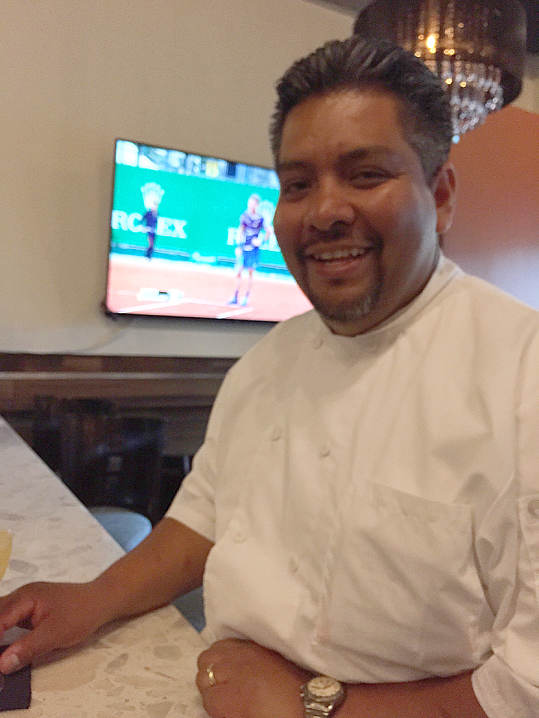 Chef/owner of La Viga and LV Mar, Manuel Martinez, spoke about using a variety of Latin ingredients — not just those of his native Mexico — as the inspiration for the menus he creates. Both of Martinez’ spots have garnered a strong following from diners around the Bay Area during the past three years, not only for the story his food tells, but also for the warm service and friendly atmosphere. While Martinez’ restaurants have received recognition from Michelin Bib Gourmand and OpenTable, they aren’t the only award winners in Restaurant Week’s lineup. Angelica’s, Crouching Tiger, Donato Enoteca, Downtown, and Portobello Grill are also Michelin Bib Gourmand and/or OpenTable Diner’s Choice Winners. If you’ve never dined out at a restaurant week event, think of it as a get-to-know-you eating opportunity. Each of the 14 participating restaurants have created an affordable three-course prix fixe menu that highlight some of their favorite dishes. Set menu prices range from $20-45 per person, depending on the restaurant’s cuisine, for a selection of appetizer, main course, and dessert. (Fine print: tax, tip, and beverages not included.) For detailed menus and restaurant profiles, check out the Redwood City Restaurant Week website. Of course, restaurants will be offering their regular menus as well. While I’ve certainly got my go-to spots in the city known for having a “Climate Best by Government Test,” Restaurant Week is motivating me to hit up those places I’ve been meaning to try. 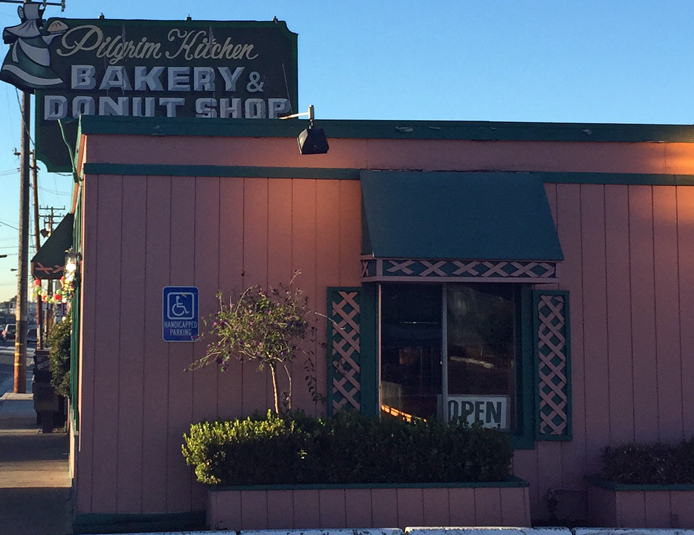 Have you dined in Redwood City lately? Which restaurants would you recommend? 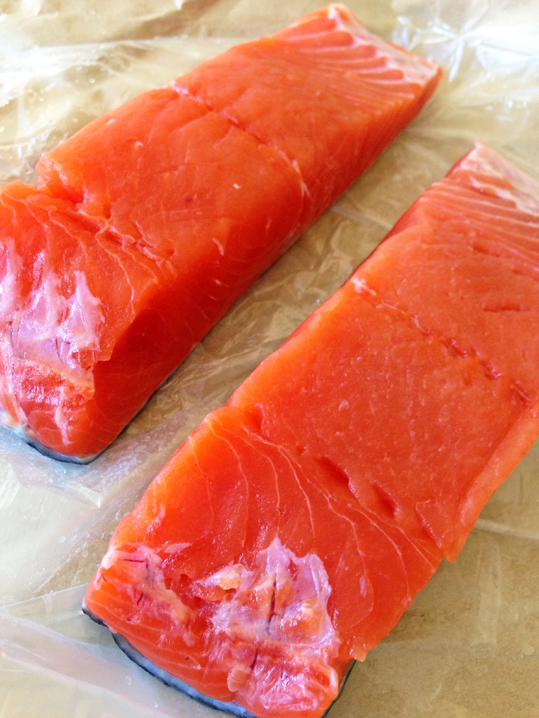 A few weeks ago, I posted about the nutritious, flavorful, fresh, wild salmon that has been available in our 650 markets. Sadly, as many good things do, the commercial fishing season for wild salmon has come to an end. Our California king salmon fishing season actually ended a month ago, and we’ve been seeing fresh, wild salmon arrive from points further and further north — first Oregon, then Alaska. Well, the supply is all but finished for the season now. If you’re lucky enough to find any fresh, wild king or coho salmon in the market, it’s coming from Alaska, and grab it while you can! My two 650 fish sources — Cook’s Seafood and Whole Foods — say that there’s maybe a week left before all of the fresh, wild salmon goes bye-bye. Frozen is still a good option, according to my sources, however. Wild salmon caught at sea is flash frozen on the boat within 24 hours of the catch. In terms of preserving the nutritional value, it’s not a bad choice. Just as a point of comparison, transit time for fresh, wild fish from boat to your store can take a couple of days. I still buy previously frozen West Coast salmon from time to time throughout the fall and winter, but the texture isn’t quite the same as fresh. Not to worry, though, there are still plenty of wild, local, seasonal fish in the sea — some of it from here in the 650. Half Moon Bay fishermen provide much of the cod, sole, and snapper that we’re seeing in local markets now. And our commercial Dungeness crab season is set to start on November 15 (sport fishing for Dungeness crab starts today!). Getting to know your local fish supplier — whether at your grocery store, farmer’s market, or community fish share (yes, there is such a thing!) — goes a long way to ensuring that you’ll get the freshest local, seasonal fish. 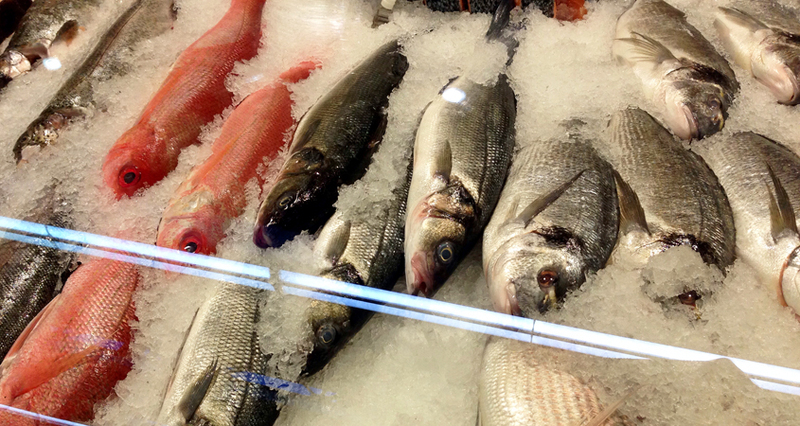 Not seeing fresh, local fish in your grocery store, or not happy with the selection? Don’t despair, there are a few things you can do! Best way to find out what you need to know about fresh, local fish options? Strike up a friendly convo with the person working the fish counter where you shop. An assortment of fillets in the 650: Bay Area Rock Cod, tropical Mahi Mahi, and previously frozen King Salmon. Which would you choose? If you shop one store regularly and like their fish selection, don’t be afraid to ask questions about the sources of their seafood (wild or farmed? ), usual delivery days for specific products (so that you can get the freshest pieces), and whether you can call ahead or special order something. And, one more thing: don’t hesitate to ask for a fresh cut of something if the fish in the case is looking a little tired (think: swordfish with a brown bloodline or brownish tuna with a rainbow “sheen”). As a consumer, you have a right to know what you’re buying and its source. (Think about it: this is something you’re putting into your body, so shouldn’t you know where it’s from and how it’s been raised?) Need another reason to know the source of your seafood? A recent article by Takepart references two different studies in which fish has been mislabeled in some grocery stores and restaurants. Shop with stores and vendors you trust, who are willing to answer your questions, and to provide the best quality product. 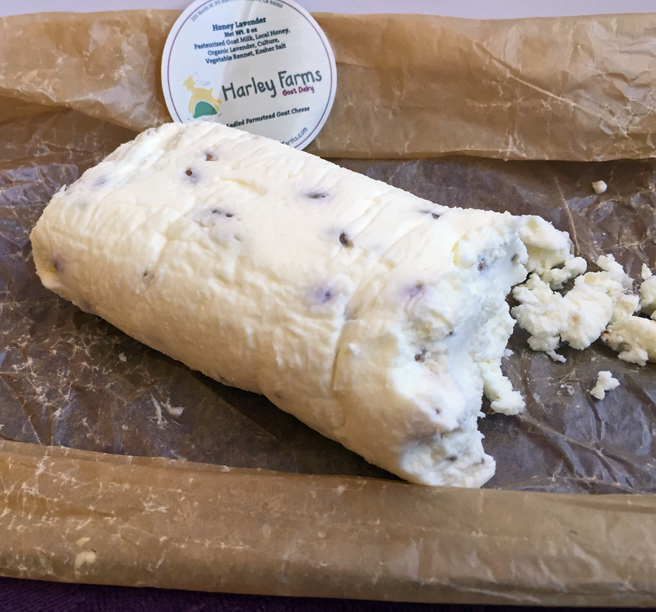 Farmers’ markets aren’t just for fruits and vegetables any more; they’re also a good source of handcrafted foods (jams, dips, chocolates), dairy products (pastured eggs, cheese), and yes, fresh fish. A few local fishermen sell through farmers’ markets, typically bringing their fish to market within 24 to 48 hours of the catch (realize that availability will depend on the weather and season). 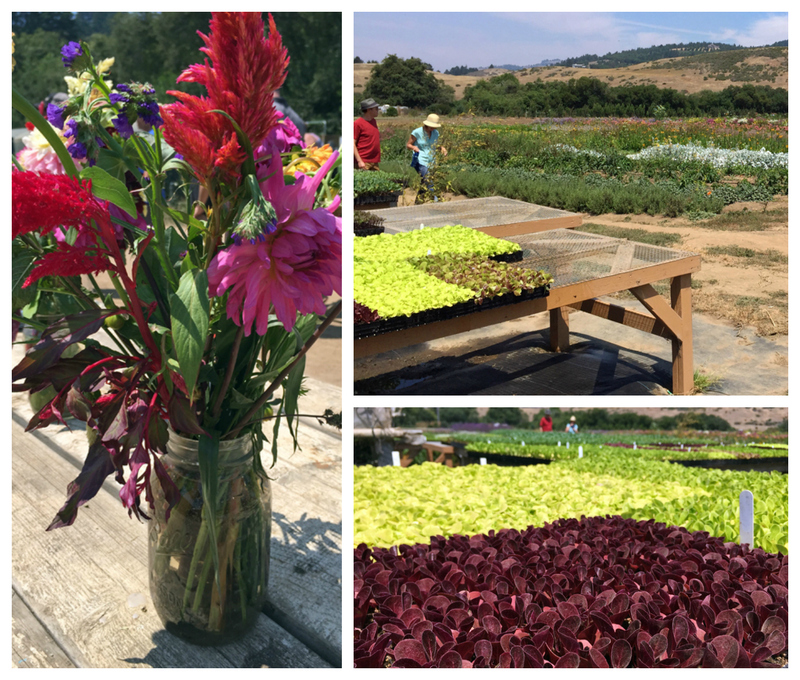 Late-running and year-round markets, such as the Moutain View Farmers’ Market, Palo Alto’s Sunday Market, and Coastside Market in Half Moon Bay are good places to check for local fish. Got mad DIY fish skills? Save money and buy direct from the fisherman. There’s good fishing right off Half Moon Bay, and some fishermen will sell their catch directly from the boat. 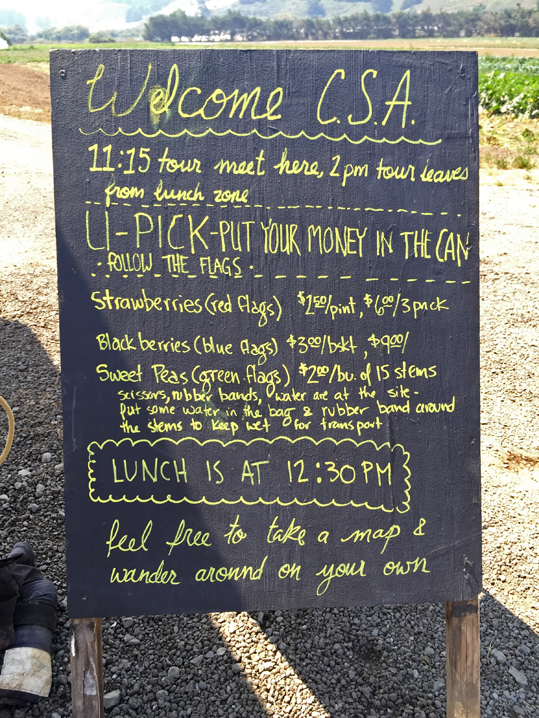 Want to know what’s fresh and available before you make the drive? 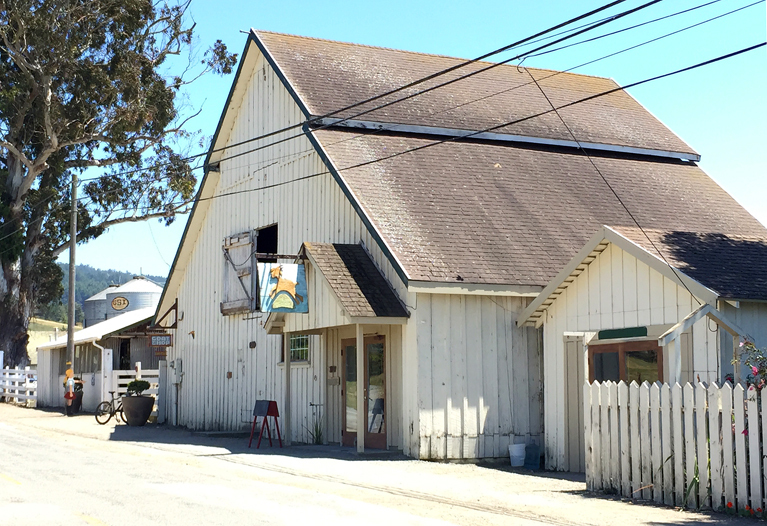 Call the Pillar Point Harbor office (650-746-8724, ext. 3) for details; they have a recorded message on their voicemail with the latest info. If you do plan to purchase directly from the harbor, plan ahead and take an ice-filled cooler with you so that you can keep your purchase cold and fresh on the drive home. Lacking mad fish skills or don’t want to clean your own fish? Take your purchase to nearby Princeton Seafood Company, where they’ll do the dirty work for you (call for pricing). Too busy to hit the market or take a drive to Pillar Point? Let the Bay Area’s fresh fish come to you. Taking a cue from farmers, some fishermen now participate in Community Support Seafood (CSS) subscription services. Much like the Community Supported Agriculture services (CSA, aka “farmers’ market box”), you buy a “share” based on the amount of seafood you want (number of people/servings) and frequency of delivery. You’ll get a seasonal assortment pulled from our Bay Area waters — Monterey Bay, Half Moon Bay, and some points north — delivered either to your home or neighborhood, depending on the plan. 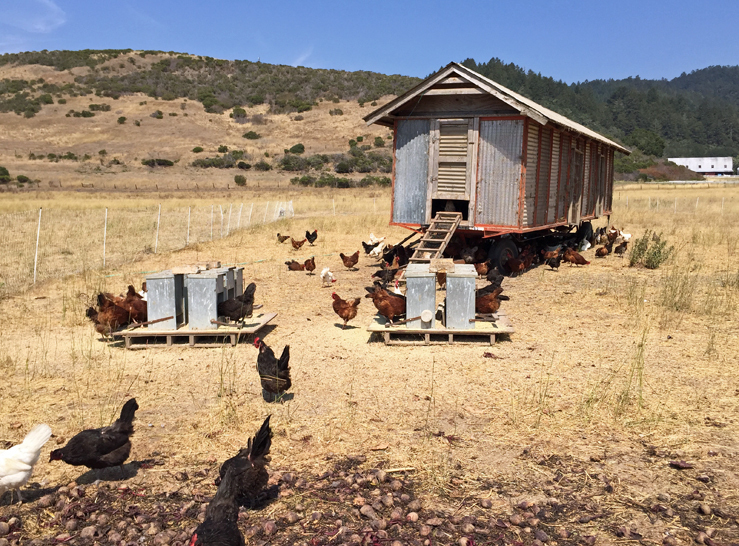 Two to consider: H&H Fresh Fish, based in Santa Cruz, and Siren Fish Co., based in San Francisco. Want to try out direct-to-your-home fish delivery that offers choices from a variety of local fish services before committing to a CSS? You can order loins and fillets of local, seasonal fish directly from GoodEggs, with no delivery fee — and they’ll deliver direct to your door. So, yes, I’ll miss the sight of bright orange salmon at my local fish place, but there’s no lack of wild, local fish available for my 650 dinner table — and plenty of options for getting them there. 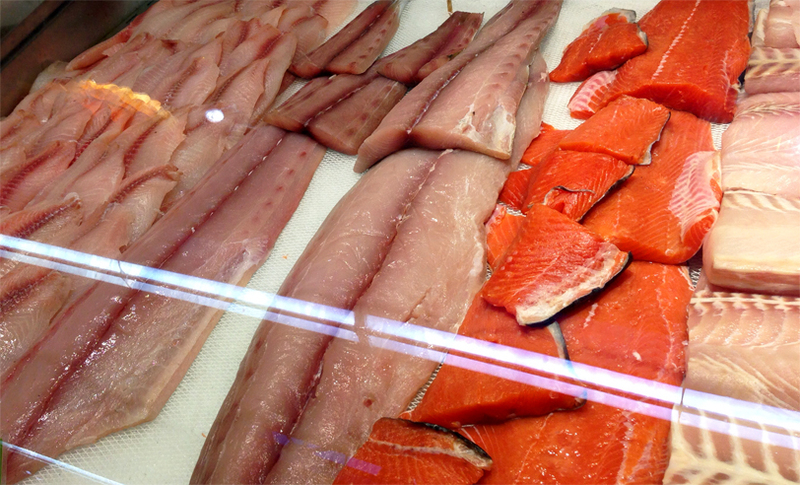 With all of these healthy, readily available fish choices, there’s no reason not to eat local. So put that frozen, who-knows-where-it-came-from shrimp back in the freezer case and get yourself some fresh, local fish for dinner! The first time I went to LV Mar — Chef Manuel Martinez’ upscale, contemporary Latin restaurant in Redwood City — I walked in on a private party. I was headed to Vesta with a friend on a cool November night, the week before Thanksgiving, when we walked by LV Mar and saw that window signs announcing “Coming Soon” were gone, the lights were on, the door open, and the restaurant full of diners. I had been looking forward to trying Chef Manuel’s new concept, hints of which he’d been offering at La Viga, his other, more casual restaurant down the street. I’ve written previously about being a fan of Vesta, and there’s always a lingering craving for their seasonal pizzas and grilled pears, but — sure, we could change plans and try something new! We marched right inside and up to the hostess, who promptly told us that the restaurant was closed. Pause. 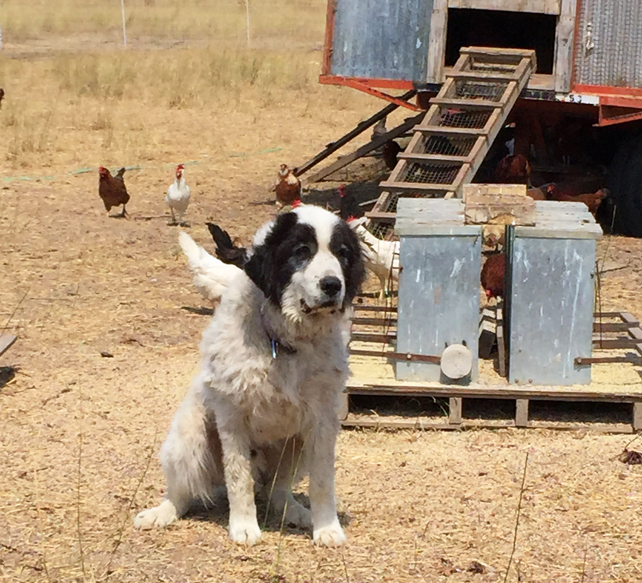 Insert confused Scooby Doo face, complete with head tilt and a verbalized “Rurh?” Um, you don’t look closed. LV Mar makes some of the best ceviche (raw fish marinated in citrus juices and spiced with peppers) in the 650. The house specialty is the Ceviche Mixto: chopped octopus, scallop, and halibut married with orange, red onion, and rocoto chile. 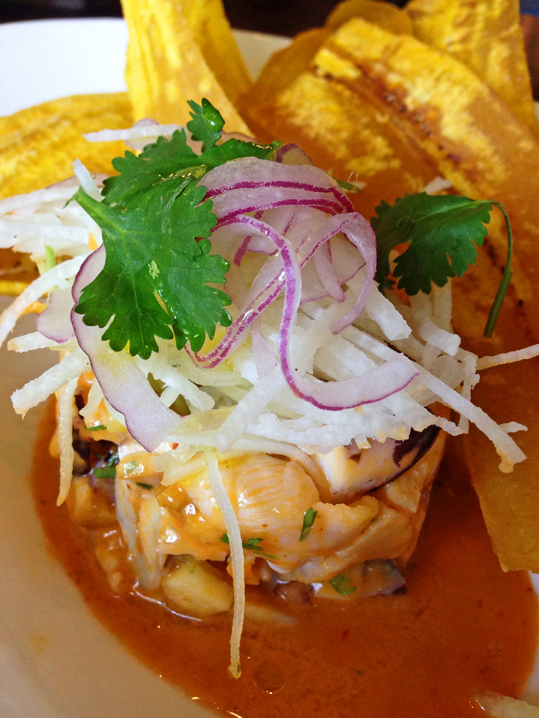 The ceviche is topped with shredded jicama and finely sliced red onion and served with crispy plantain chips. Sweet, spicy, tender and fresh, this dish reminds me of afternoons under a palapa bar on the beach in Zihuatanejo. Friends ordered this small plate during our celebration dinner, and I just had to taste it. Oh my! 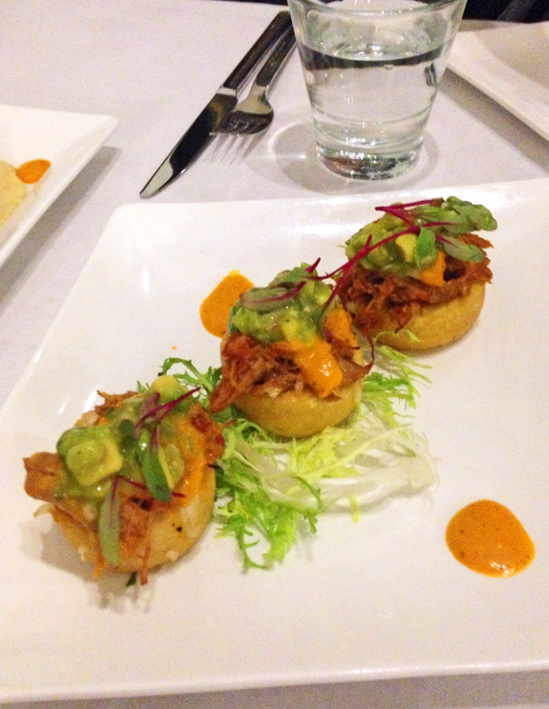 Rich shredded duck leg confit is spiced with chipotle and onions, nestled onto a small, deep-fried masa pillow and topped with manchego cheese, avocado, and tomatillo salsa. They might be bite-sized, but these small delicacies are full of flavor! Another favorite small plate, the Cayo Dorado is served like a small soft taco (although I couldn’t eat it like a soft taco — this one is best with a knife and fork). 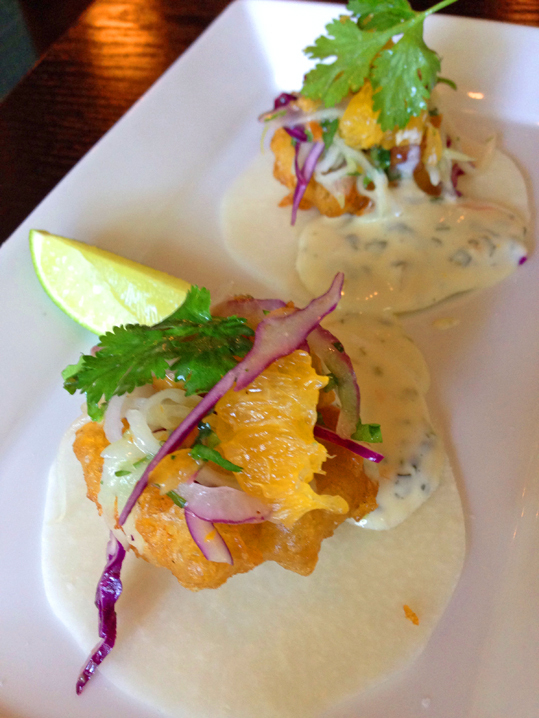 A perfectly tender, lightly battered scallop sits atop a thinly sliced piece of jicama — the “tortilla”– and is dressed with cucumber, orange, and sweet habanero cream. 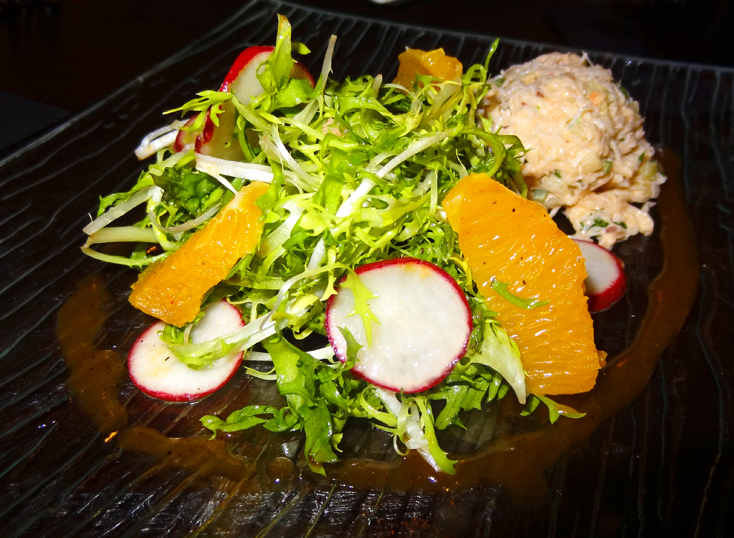 The crab salad, one of several salads on the menu, stars our local favorite shellfish: Dungeness crab. Like most of LV Mar’s dishes, this one incorporates a variety of flavors and textures: soft and sweet (the crab salad), crisp and slightly bitter (the frisee and radishes), tart/citrusy (orange supremes and dressing). Note: Yes, the dish does include avocado (aguacate), but I’m not a fan, so the kitchen graciously accommodated my request to 86 the avocado. The photo below was taken November 2013, and the presentation might be different now. While I usually prefer to sample a variety of small plates, there is one entrée that I’ve tried and found craveable: pan-seared, pepita-crusted fish. 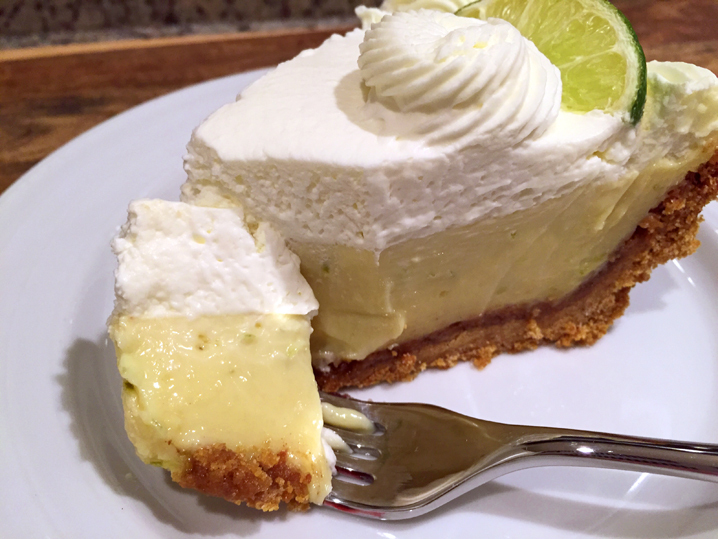 This version is currently not on the menu, but I’m hoping it returns in the fall. 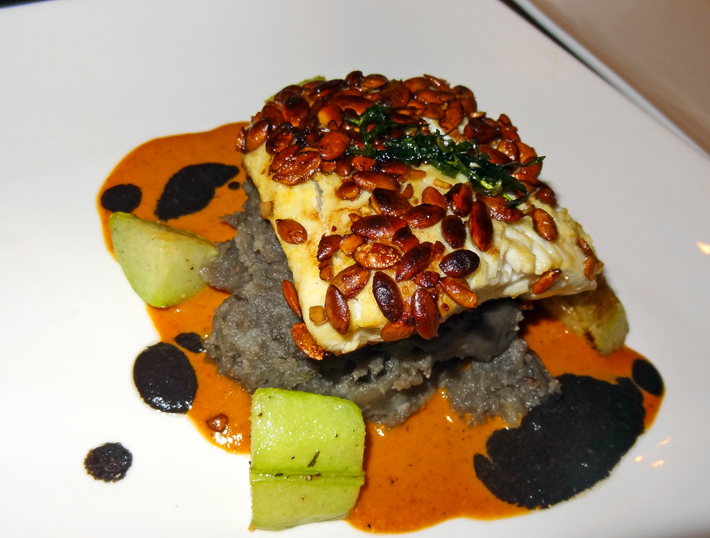 It’s cool-weather, belly-filling comfort food all the way: pan-roasted pepita-crushed sea bass, served on a bed of corn truffle purée, surrounded by pieces of chayote squash and two pepper sauces. The current seasonal version is Pescado Sarteneado: pan-roasted wild Alaskan halibut, asparagus, corn truffle and potato croquettes, guajillo chile emulsion. If you like to start or end your meal with an adult beverage, you can choose from an assortment of beers, wines, and wine-based cocktails. (Note that the restaurant doesn’t have a full liquor license, though, so don’t expect shelves of tequilas or an array of fancy margaritas.) Chosen to pair with the food menu, wines are on the lighter side and hail from Spain and South America. The wine-based cocktail menu tends toward the fruity side, and includes a classic sangria, along with cocktails built around wine “spirits,” such as agave wine, wine vodka, and sake. On my list to try: the El Morado (blackberry-basil mix, petrov wine vodka, sparkling wine) and the Gingerito (mint simple syrup, ginger mix, sake, ginger beer & fresh lime juice). Beer choices include an assortment of bottled beers and beer on tap. Non-alcoholic drinks include fresh lemonade and a horchata, a rice drink with spices, shaken over ice with coconut milk. 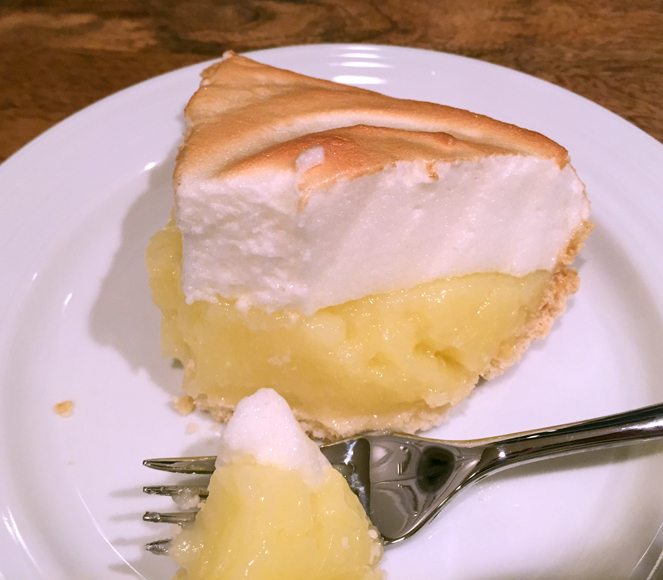 This one should be on the dessert menu — it’s so rich and decadent! 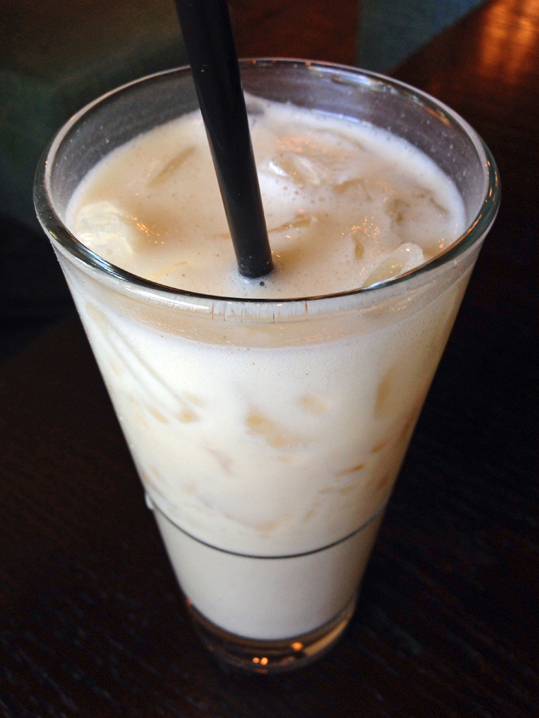 Horchata with coconut milk: rich, sweet, and delicious! The dessert list is small, but hits the usual notes: chocolate, fruit, cake, ice cream. If your idea of dessert involves chocolate and little else, try the flourless chocolate cake. It’s a small but rich dessert, and I’m fairly certain the only ingredients are chocolate and butter (and that’s not a bad thing)! Want something more summery? 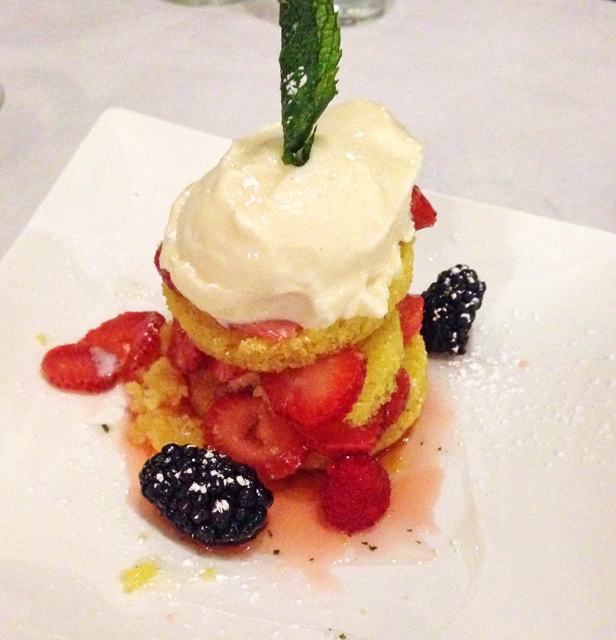 The Torta de Fresas takes a Latin twist to a classic American shortcake: thin slices of sweet cornbread, layered with mixed berry compote, topped with horchata ice cream and finished with a light mint syrup. There you have it — my highlights of dining at LV Mar since it opened to the public. Have you tried LV Mar yet? What did you eat? Bar: Beer, wine, and wine-based cocktails. No spirits. Parking: Street and nearby lots. 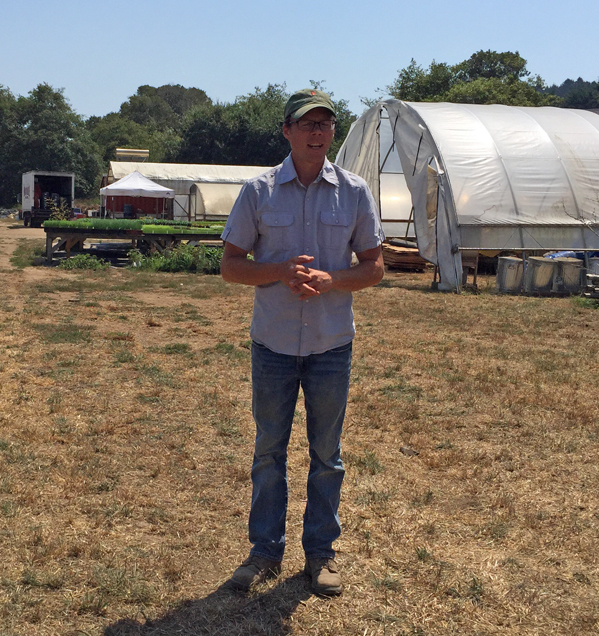 Grow Local: How Does Your Garden Grow? 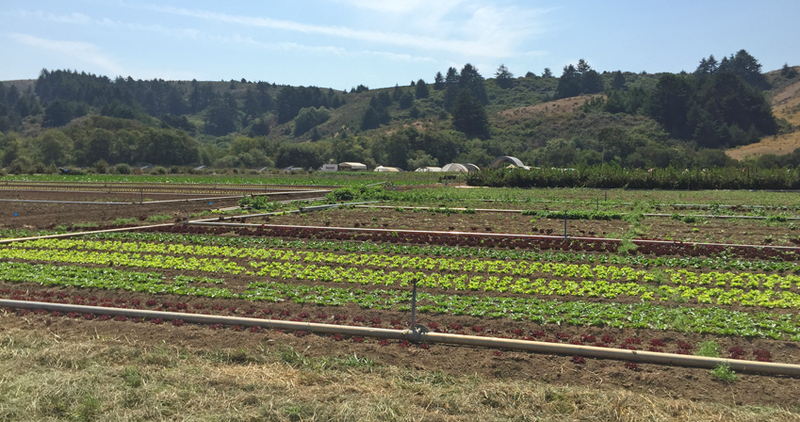 As we’re heading into the last weekend of May, it’s time for the first update on my attempt to grow food. After just about a month, my little garden is flourishing! 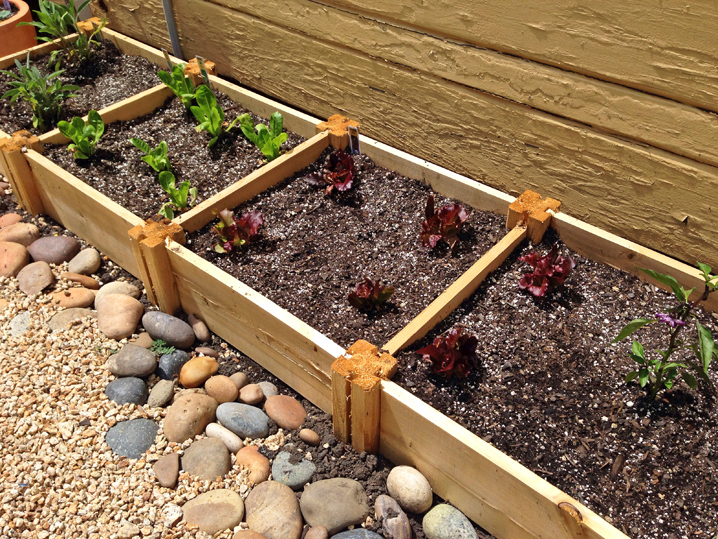 To date everything I planted is thriving, and much to my surprise, the lettuce is overflowing the planting boxes. 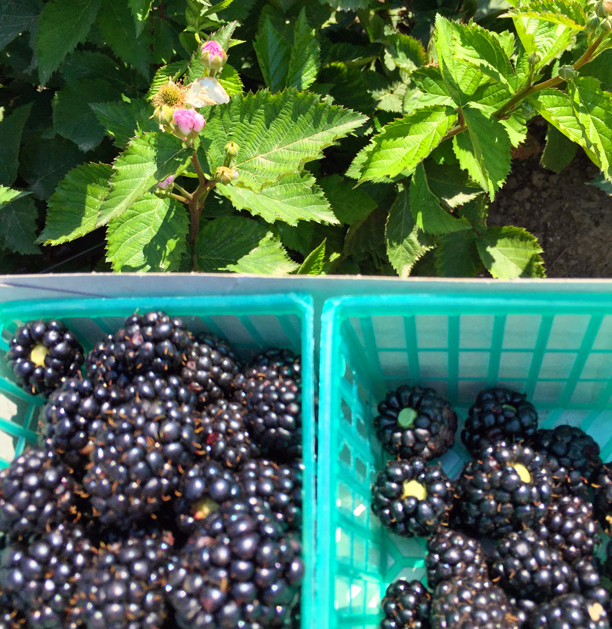 As a comparison, here’s what they looked like when I planted them four weeks ago. 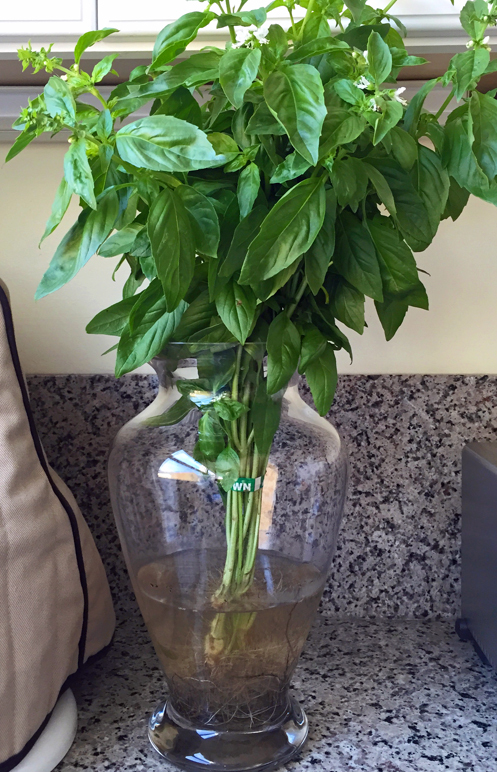 Amazing what good organic soil, sunshine, water, and a little TLC can do! 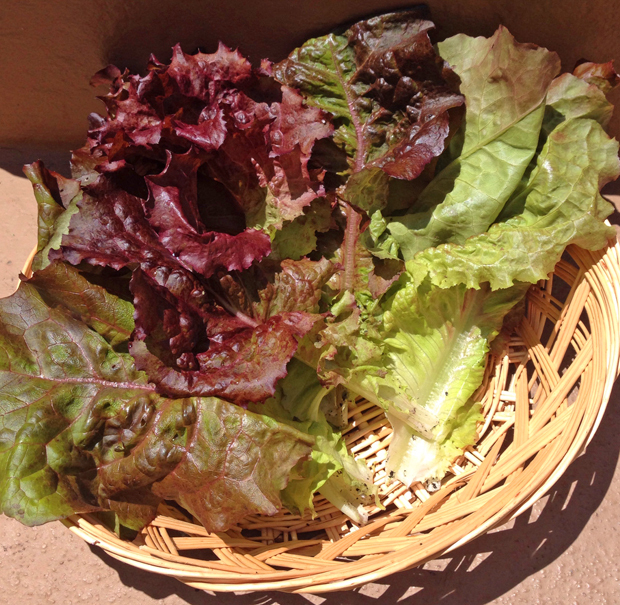 Just this week I’ve started harvesting the outer leaves for small salads, pulling only what I need from the garden. I hope I can keep this going through the summer — continuing to harvest leaves as I need them, without having to harvest entire heads of lettuce that might go to waste. The peppers and tomato plants are taking their own sweet time, but they do have a longer growth time (75-90 days) compared to the lettuces and herbs (30-60 days). 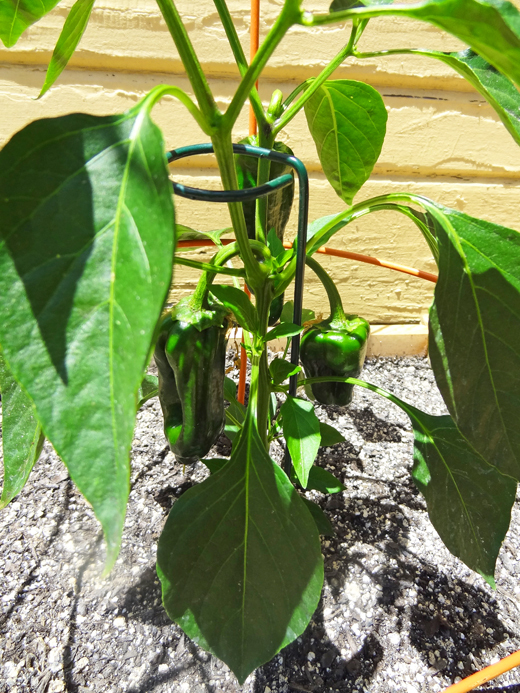 The anchos are the frontrunners right now, with three peppers, while the purple jalapenos are a close second. Yep, there are three ancho chili peppers in there! 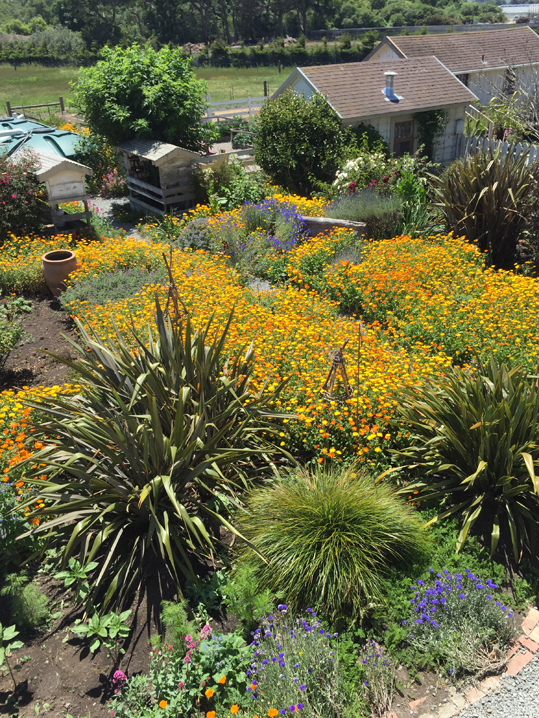 If you’re thinking about starting a garden, it’s not too late! 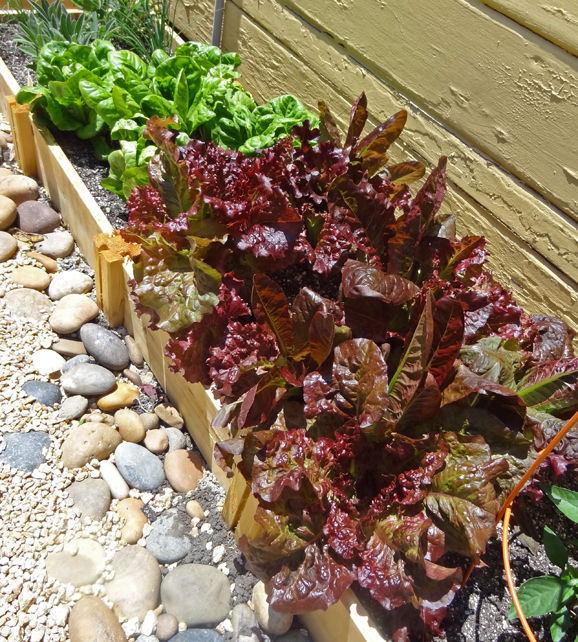 Lettuces are much easier to grow than I ever imagined, and they give an abundant return for your time and effort. Peppers are sturdy and do well in containers — but you need some patience because they do take up to three months to really produce. 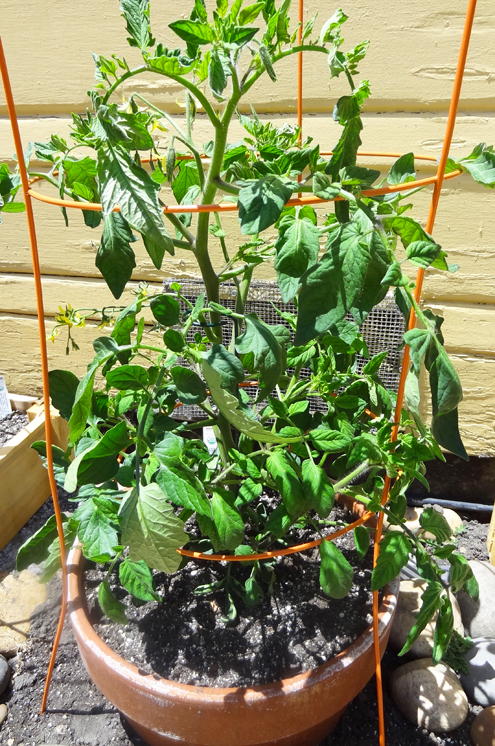 Tomatoes do amazingly well in the 650 — my plant start was four inches tall with no flowers a month ago, and now it’s almost 24″ tall with lots of flowers (which means, if all goes well, fruit will follow!). You can check out how I put my little garden together here. 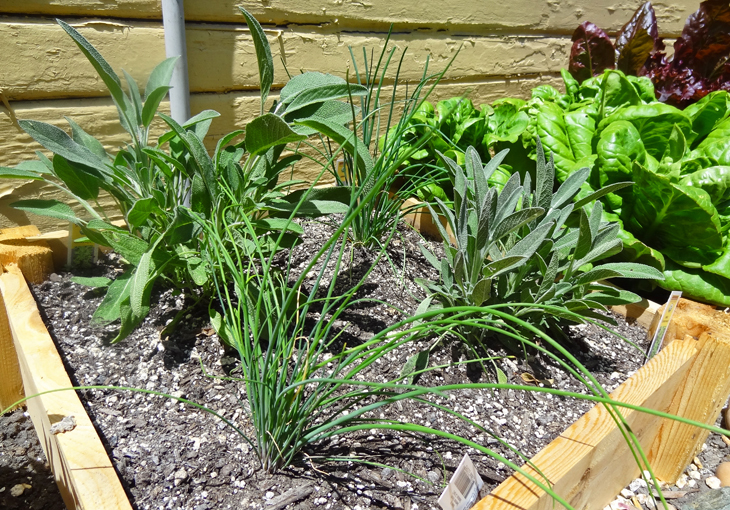 The post also includes resources for more gardening info. Eat local: West-coast halibut with Nut ‘n Bean Cashew Jalapeno Cheese and chives from my garden. Salad of homegrown lettuces, CSA-box beets and carrots, and feta. 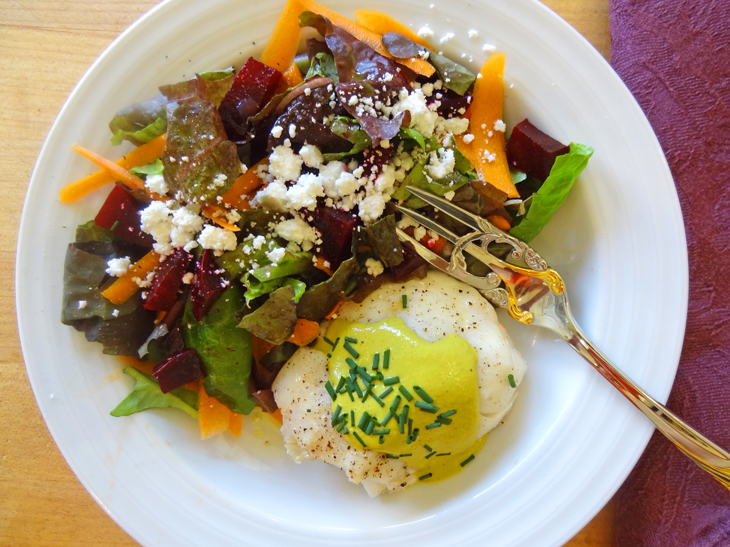 The run-on, menu-style description: Baked west-coast halibut, topped with Nut ‘n Bean Jalapeno Cilantro Cashew Cheese “sauce,” and chives, served with late-spring rainbow salad. The salad brings together lettuces from my garden, carrots and beets from my CSA delivery, a sprinkling of feta from Marin, and a simple dressing of olive oil and lemon juice (yes, from local lemons). With the exception of the fish and the olive oil, every ingredient on this plate comes from within 85 miles of where I live. How cool is that?! 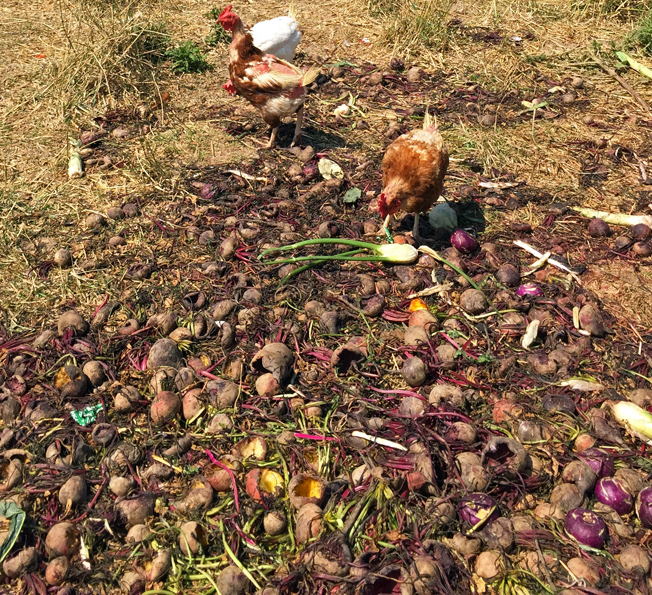 Of course, you can vary the protein based on your budget and diet (chicken or tofu could work, too), and the salad fixin’s based on what’s available in your garden or market. The point here is that it’s so easy it is to create a good, fresh dish from local ingredients. I know what you’re thinking: “I don’t have time to cook something like that.” Au contraire! Halibut takes 13-14 minutes to bake; other fish or proteins might time a little more or less time. During that time, you can wash, chop, and assemble the salad ingredients. Overall, figure about 30 minutes to prep and assemble a meal like this. The best way to enjoy a meal like this in the 650? Grab a chilled bottle of wine (or some homemade sangria), your favorite people, and head to the back yard for some nice al fresco dining. What more could you ask for this weekend? You are currently browsing entries tagged with eat local at 650Food.